With the wearable solution for the Honeywell Dolphin 70e you make users even more flexible than before. Attach the mobile computer comfortably to your arm and suddenly additional areas of usage are possible, such as warehousing and pick-by-voice. Additionally, you easily connect a 1D or 2D ring scanner via cable or Bluetooth, to also increase data capture options. 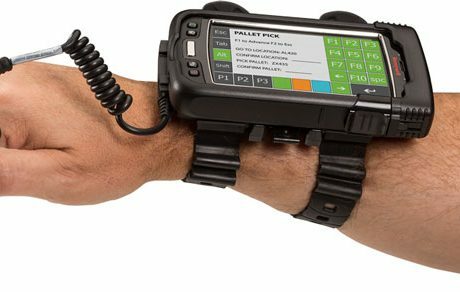 The combination of the Dolphin 70e, wristband and scanner together weigh less than 500 g, light enough even for longer operation times. Equipped with a 1 GHz TI OMAP processor, 512 MB RAM and 1 GB Flash memory, the Dolphin 70e Wearable provides the right base for nearly every application and comprehensive data capture. The MDC scores highly with Windows Embedded Handheld 6.5 and a 4.3″ WVGA color display (480 x 800) with capacitive touch. Wi-Fi (802.11 a/b/g/n) and Bluetooth guarantee highly reliable wireless data transfer. Certified according to IP54 standards, the Dolphin 70e is well suited for usage in rugged environments and in demanding production plants.